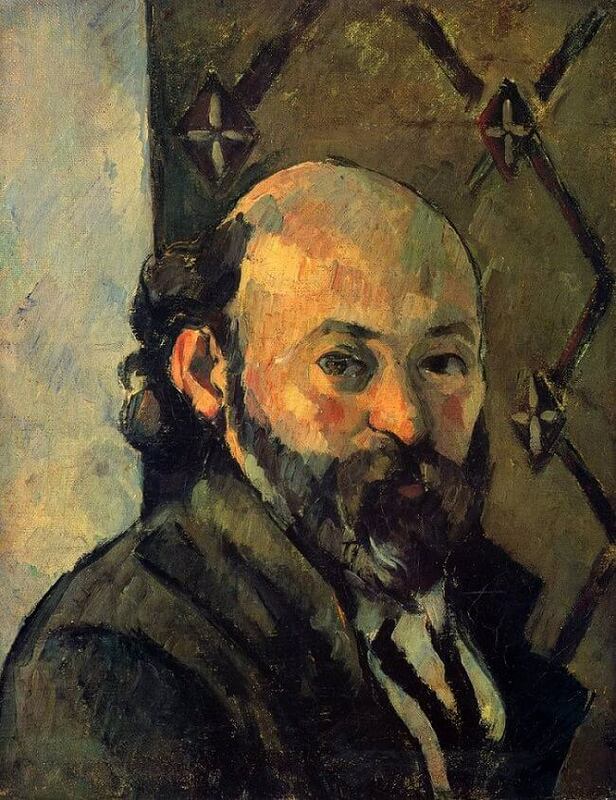 We have from cezanne's hand over thirty self-portraits. They are not only documents of his appearance over the four decades of his career as a painter; they also indicate a continued self-concern surprising in an artist of classic tendency. In several of them, this self-awareness struggles with his pictorial impulse or habit, and we sometimes find together in the same portrait acutely observed physiognomic features and some geometric detail that gives an abstract inhuman air to the part. We have become so used to looking at Cezanne's forms as constructive relationships that we enter with difficulty into the expression of the lines and areas. In this portrait with the intense right eye, the prominent brow, the beard and mouth sunk into the body with hunched shoulders, what is the meaning of the lozenge pattern of the wall paper? What does it do to the face and the picture? It surrounds and glorifies the bald head with a starred angular halo - its enclosing character is assured by omitting the lines of the ornament that would meet the head and pass behind it. This angular form, so much like the zigzag of the lapel, is opposed to the massive roundness of the head and of the shoulder thrust towards us. The duality of round and straight forms appears at first as a contrast of the living and the geometric, but we discover soon that the zigzag of the ornament and the lapel are not altogether distinct from the face; their diagonal angular form recurs, though less rigidly, in the nose and beard and eyebrows; and the little star-cross lozenges correspond to the eyes and nose. This wedding of the organic and the geometric has a beautiful simplicity which makes us overlook or accept the arbitrary treatment of the wallpaper pattern. The ornament is not used for surface interest, but as a necessary element of structure in a whole of great concentration and weight. The opposition of curved and straight is only one of several strong dualities pervading the work: light and shadow, the modeled and flat, the vertical and diagonal, the concave line and convex, the open and closed-all interwoven or crossed. On the physiognomic level, there is a similar search for contrast in the upper and lower parts of the head and especially in the eyes, one dulled and recessive, the other more strongly marked, alert, and opened towards the light. In execution as well as in forms, this portrait marks a new stage. It is painted in a cooler, more meditative spirit than the head of Chocquet, with greater economy of pigment, pressure and movement, and is more beautiful in s ubstance and tone. The search for clarity and a firmer order determines a smaller, more uniform brush stroke, with a common slanting direction which is subordinate, however, to the power of the larger forms. There is more drawing of shapes - we see this especially in the dark lines defining the curves of the bald brow and the shoulder; but these rhythmical lines, which are so clearly responsive to the neighboring forms, are also notes of color in the grave scheme of interchanged contrasts of dark and light, warm and cool.